New year, new streetscape for the Herring Cove Road. The Herring Cove Road Project has begun. On January 10th, over 100 residents gathered to pore over a thirty foot long set of maps and diagrams of the Herring Cove Road at the Captain Spry Rec Center. The City had invited them there to peer down, God-like, to point out the parts from the Armdale roundabout to McIntosh Street that dissatisfied them the most, while a full complement of City staff and consultants asked careful questions and took notes about what they’d like to see. The Herring Cove Road Project had been launched. And when I say “full complement,” I mean exactly that: seven individual departments from HRM, two outside consulting companies, and they’ve reached out to a half-dozen community groups and transit wonks to get a start on the stakeholder engagement part of the process of revamping our Main Street. The project is slated to deliver a report in six weeks. “The project received funding through the provincial government’s Connect2 program. The consultant’s work must be completed by end of March 2019. This is an aggressive, but achievable, timeline,” says Harrison McGrath, HCRP project manager from Halifax’s Strategic Transportation Planning team. The Connect2 program is aimed at enabling sustainable transportation design and research, emphasizing active transportation – walking, cycling, and the various other forms of rolling under this heading – as both a necessary part of community-building and a potential pathway to a low-carbon future. That fits the City’s conceptual framework for the Herring Cove Road. It’s been designated as a strategic corridor – existing road corridors that are key to regional traffic flow, transit, goods movement and active transportation – under the Integrated Mobility Plan, the comprehensive transport strategy unanimously approved by City Council in 2017. “The Herring Cove Road has a significant role in moving people by various transportation modes, including active transportation, transit, goods movement, and private vehicles. The IMP provides a new vision for transportation in the municipality. Municipal staff prioritize sustainable transportation and focus on moving people efficiently,” says McGrath. Elevator pitch version: it’s about moving people and things, not vehicles. That’s a departure. Fifty years ago, adding road capacity was the go-to method of getting stuff done in the world of urban planning. 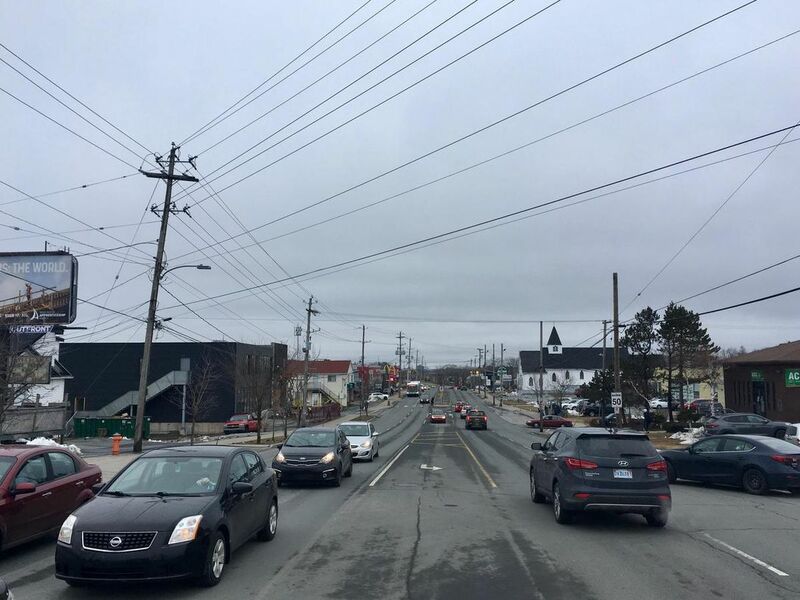 Extensive road widening projects on the Herring Cove Road were planned to link up to a massive road network that would have plowed across the harborside downtown, crossed the Arm and linked up with Spryfield in a triumphant ring road, embracing the whole of Halifax in a cozy, if smoggy, embrace. But it never happened. People questioned the wisdom of bulldozing the heart of old Halifax to build a truck corridor, kneecapping the plan as designed, and we ended up with the Cogswell Exchange and a few detached sections of highway in the middle of Spryfield. The patchwork nature of the Herring Cove Road is a legacy of that time. It wouldn’t have mattered if the project had been completed. In the 1970s, they weren’t aware that cleaving off more space for roads was a technically flawed solution. “Increasing vehicle capacity leads to induced demand, meaning the easier it is to drive, the more people will drive. As more people drive, the widened road begins to see congestion, and the process repeats itself. Induced demand has been proven all over the world,” says McGrath. And in the end everyone is getting to work through the Armdale Roundabout, and it’s not getting less crowded any time soon. “The Armdale Rotary is the busiest municipal intersection. The roundabout has been studied many times. Without significant investment, improving traffic flow there is difficult.Therefore, large investment on the roads leading to the roundabout would result in vehicles experiencing the same pinch point a little quicker,” McGrath says. The City has looked at a few options – many of you will remember the 2015 community meeting about the Herring Cove Road and Purcell’s Cove Road intersection, where various rejiggings of the Roundabout approach were proposed, all of which has been subsumed by this current Herring Cove Road project – and the most effective ones involve ramps, flyovers, and other heavy-duty infrastructural changes that have correspondingly heavy-duty price tags. Which is why if this is approved the City will be building it over a number of years. It’s unlikely that they will fund a major end-to-end construction project, and instead build it in chunks as the road needs updating. The framework offered by the IMP is a cost-conscious way of increasing mobility, as the easiest and cheapest ways of increasing mobility are pedestrian, cycling and transit improvements. Plus a bonus: by incentivizing people back out on the street, these improvements help recreate that human-scale Main Street feel that has been proven across North America to be a major boost to local business. As a member of the Spryfield Community Association, I was happy to see the scope of the Herring Cove Road Project will include the sidewalk and road improvements around the 500 block that we’d spent two years advocating for. Those improvements are now included in the provisional 2019/2020 draft budget, so if the budget is approved the first groundbreaking will likely be in that area. SCA volunteers, City staff, and District 11 Councillor Steven Adams put a ton of time and effort into getting this project figured out and underway. Judging by the amount of work we did on just that single kilometer of roadway, the HCRP can hopefully knock a few years off further community efforts to update and wring a bit more utility out of our streetscape. Talk of induced demand, sustainable transportation and strategic corridors aside, getting the best of our Main Street is really what it’s all about. The look and feel of the area, the benches, trees, grooming a fertile ground to grow great local businesses, and having chance meetings with friends walking down the road, that’s the core of it. The IMP and the HCRP, they’re the thing that gets us there. Feedback on two draft functional plans will be sought at an open house on February 28th at the Captain William Spry community room from 6:00pm-8:00pm. The final version of the report is slated for the end of March. I look forward to gathering over the map again, but it this time we won’t be playing point-out-the-problem but spot-the-solution instead. Edit, January 30th: Quick corrective note here; the original version of this article said the completed report would be available on February 28th, which ain’t true.